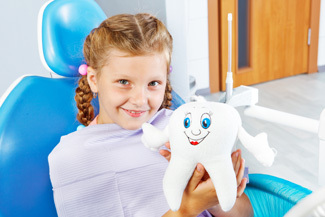 Kumeu Dental treats patients of all ages, including children. Starting an early routine of preventive care services for your child can ensure the longevity and health of their smile as they reach adulthood. It’s recommended that children see a dentist for their first examination around the time of their first birthday. These early care appointments allow the child to become accustomed to our office and provide us with time to spend with you, the parent, discussing oral development, healthy nutritional habits, oral hygiene instruction, and any preventive care services that your child is comfortable receiving. In addition to their exam, children who are comfortable will receive a cleaning, dental x-rays, fluoride therapy and sealants on their permanent teeth. It’s often thought that if a child develops decay in one of their baby teeth, that the tooth will simply fall out and be replaced with a permanent tooth so there is no need to worry about the baby tooth. In reality, these baby teeth help guide the development and eruption of the permanent tooth below. Premature loss of a baby tooth can result in tooth misalignment, crowding, or impacted permanent teeth. Because baby teeth decay at a rapid rate, it’s important to treat these areas early on to prevent the infection from spreading to adjacent teeth. Abscessed baby teeth can damage the developing permanent teeth, and may place them at risk for hospitalization. If your child loses a tooth prematurely, our team of dentists can help use preventive measures to maintain the spacing of the teeth in order to minimize orthodontic complications later on.